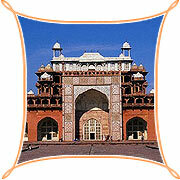 The state of Uttar Pradesh is a vast territory of rivers, monuments, temples and a lot more. Uttar Pradesh offers an endless array of attractions to the tourist, by way of monuments & mountains, a wealth of ancient temples and viharas, rich flora and fauna, fascinating rivers and captivating valleys and the religious fervour that it evokes, have made Uttar Pradesh one of the most interesting states of the Indian Union. 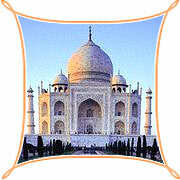 Taj Mahal is the most famous landmark of Uttar Pradesh. Bara Imambara, Chota Imambara, are other star attractions. Other memorable places to visit are the historic cities of Agra, the pilgrim towns of Varanasi, Allahabad, Mathura-Vrindavan, Rishikesh and Chardhams, Buddhist centres like Sarnath and the enchanting hills of Kumaon and Garhwal. The most romantic tomb ever created, the Taj Mahal houses the tombs of the emperor Shah Jhan and his beloved queen Mumtaz Mahal, situated in Agra. This wonderful marble edifice took over 21 years to make and is the finest jewel of art and architecture of the Mughal period. Laid in the formal design of Islamic gardens, the tomb is set on the banks of the river Yamuna, its massive dome and minarets reflecting in the waters of the river aswell as the water channels of the garden. The pure white marble of the tomb takes on the subtle changes in sunshine, and indeed moon light, and seems to change colour throughout the day and night. The tomb is usually open from morning till sundown, but during the full moon, the tomb and its gardens are left open to the public so that we can all enjoy the pearly white Taj in milky Moon light of the full moon. It is a marvellous sight to behold at any time of the year and is a magnet for lovers from around the world.